Choosing (coincidentally) to start this book while being at a conference helped to reinforce its message. Here I have been spending all day sitting and listening to people who spend their lives managing, making decisions, planning, dictating, collaborating, and policy-making, so I could aspire to one day be as successful as they are. At night, however, I’ve been receiving a completely different message. The message from the book encourages doing things. What a contrast! I haven’t yet finished the book, and I’ll not try to summarize it here. Instead, I’ll simply say that if you’ve had a nagging urge to actually produce something instead of spectating, consuming, or making choices, you might be interested in Mr. Crawford’s message. 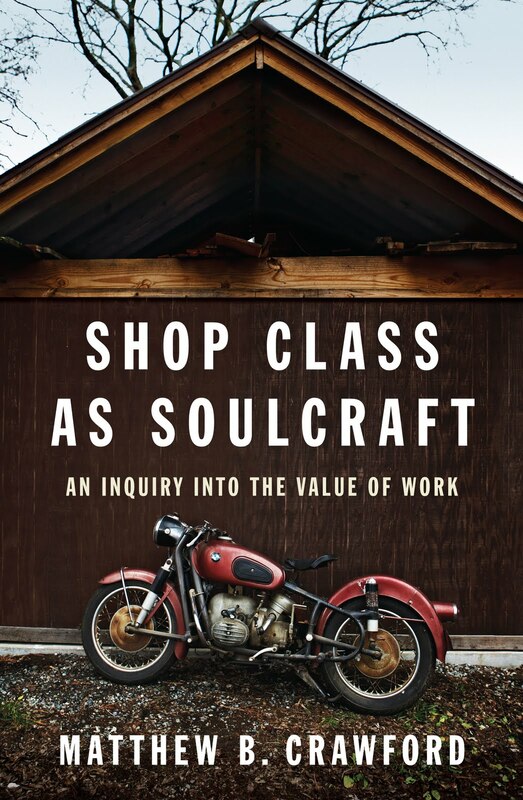 Whether it is music, creating something, growing something, or repairing something, he makes a good case that we undervalue work and overvalue consumerism and exercising choice. To my friend, Brad, maybe this should be on your “required reading list”, along with works of Wendell Berry, for your future economics classes. To my father-in-law, Burton, because I see you live it each day, I know you already understand what this book says, but you still might find it interesting how so many of us sadly don’t get it. To my daughter, Lisa, this might be a logical “its your turn” follow-up to the last two great books you’ve recommended to me. It seems to fit in pretty well with the general theme of our discussions.